‘Bei’ is an endearing term meaning Mother in the Pnar language of the Jaintias, a sub-tribe of the Khasi people of Meghalaya. Bei Bina is one of the retailers of Khasi spices in Shillong. I had an appointment with Bei through my sister Lina who knows her well. My intention was to get her story for the friends of Zizira. It turns out Bei Bina Shylla is one congenial, lovable little old lady. Quaint too, like her little shop at Shillong’s Iewduh market. I thought she also has one of the most delightful toothless smiles I’ve ever seen. A smile that oozes goodness from the heart. It’s been so long since I actually sat in a shop at Iewduh. This meeting with Bei threw me back in time to my growing years in the 1960s. That was when our own Grandma ran three shops opposite Bei’s (we still own those shops, though now they’re rented out). How we loved visiting after school. Grandma always ensured we get to eat ‘Jadoh’, a Khasi rice and pork pulao spiced with black sesame. But that’s another story altogether. Bei’s shop is older than she. 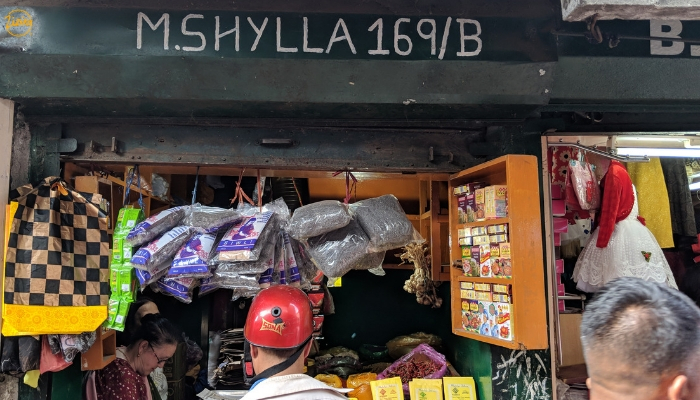 ‘My mother started this shop in the 1930’s or 40’s, much before India’s Independence’ she said. As a little girl, Bei used to come to the shop. But when her mother died, a relative ran the place for quite some time. At first, Bei had no intention to be a shopkeeper. It was her husband’s sudden demise that propelled her to full-time shop-keeping. That’s how she made ends meet for her family of eight growing children. Now Bei Bina is in her late 70’s but still as sprightly and agile in mind and movement. She’s witty too, I found out! And so, on this bright late September forenoon there we were, sitting hunched together on little stools in Bei Bina’s quaint little shop. ‘I sell mostly spices’, she told me. I can see that. On traditional bamboo trays are displayed black peppercorns, cumin and coriander seeds. Turmeric, nei-lieh (Perilla seeds), nei-iong (black sesame), bay leaves, onion, ginger—the common ginger and the spunky ‘ing makhir’. Then there’s garlic, dry red chillies, chilli powder, paprika powder, rock salt — all crowding the little space. Between questions and answers, customers keep stopping by, asking for this and that. Bei’s patience and politeness are amazing. Her dexterity and alertness are astonishing too. Never once did she fumble, whether in weighing the items or calculating the money. All with a smile that never lost its way off her gentle face. She was weighing 100 grams black pepper powder a customer wanted when he changed his mind and asked for 250 grams instead. She added more and the customer remarked that the packet would be too small. ‘That’s why I’m putting all this into a bigger bag for you’ she gently assured him. The smile lingered as she plops the small pack into a bigger bag. ‘I source the peppercorns from Jowai and get them powdered by machine spice grinders here in the market’. 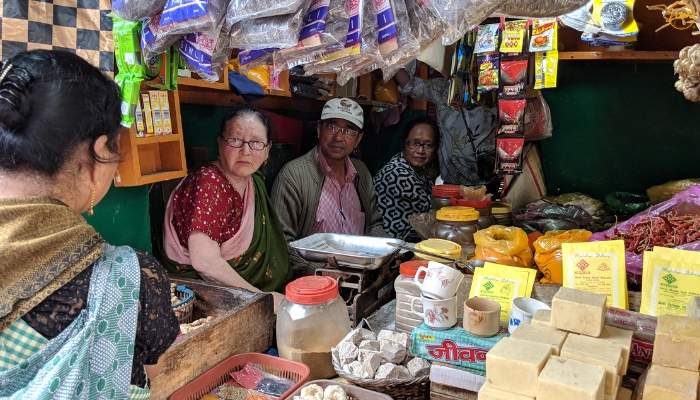 Bei says she gets most of the spices from regular and trusted suppliers in Jaintia hills. ‘What about coriander, cumin, panch phoron (a five-spice mix) and others that are not original khasi spices? Bei agrees some spices are acquired tastes that came along with the plains people. Now they’ve become integrated into our cuisine. This is especially true with cumin, coriander, cardamoms, cinnamon and cloves. A customer asked for bay leaf powder. ‘You have that too?’ I said. ‘Yes. It’s quite in demand. Perhaps people find it more convenient’. As we continued our chat the stream of customers also continued, with different needs. Some asked for washing soap, which she sells by weight. Some wanted ‘Modi Masala’. Modi is a very old company from Shillong. It was they who first introduced local ‘grounded masala mix’ here. The same style paper packaging and emblem continues to date as when they started in the 1970’s. Bei says they are still popular. ‘What’s the single most in-demand item you sell here if you can name one?’ I queried, wanting to zero in on something. Bei creased her brow. ‘Well…that’s difficult to say. Everything sells. But yes, people look for Lakadong turmeric. I sell about 5 kilos a day, sometimes 10’. At that moment an old man came asking for turmeric. ‘Which one do you want? I have three varieties’. The old man took the third variety. I wanted to know the difference so Bei told me. The number one variety is the original Lakadong. It is the most expensive but has the highest sales. The second variety is a mix between Lakadong and possibly turmeric from Ri-Bhoi. The third variety is an ordinary powder with not much colour or aroma in it. Bei took a pinch of Lakadong turmeric on her palm and rubbed it. A deep yellow stain coloured her palm. ‘This is the way to know the quality. If it is good, a deep colour sticks to the palm. Otherwise, it falls off leaving a fainter stain’. I was curious to know about her turmeric supplier. 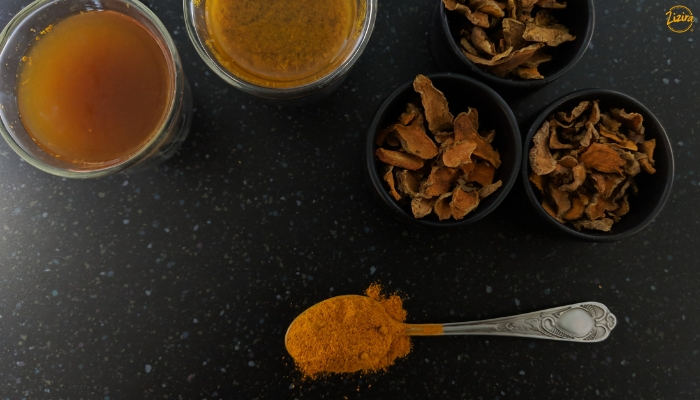 ‘Earlier there were only the synteng turmeric (meaning Lakadong) and Bhoi turmeric (from Ri-Bhoi district)’ replied Bei. ‘Nowadays you can see so many varieties. 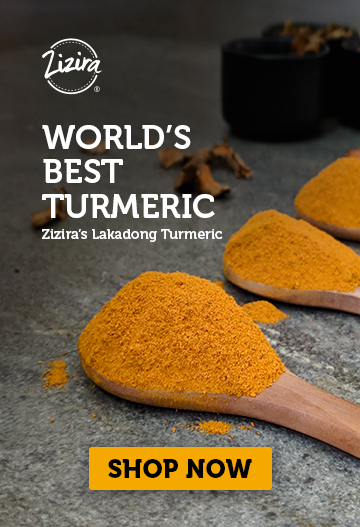 But none can beat Lakadong turmeric’. Bei reveals that she even gets orders from Australia once in a while. A friend who migrated there only uses Bei’s number one Lakadong variety. Once a year when the friend visits Shillong she takes back 4-5 kilos of the spice. Now that’s awesome, I say. 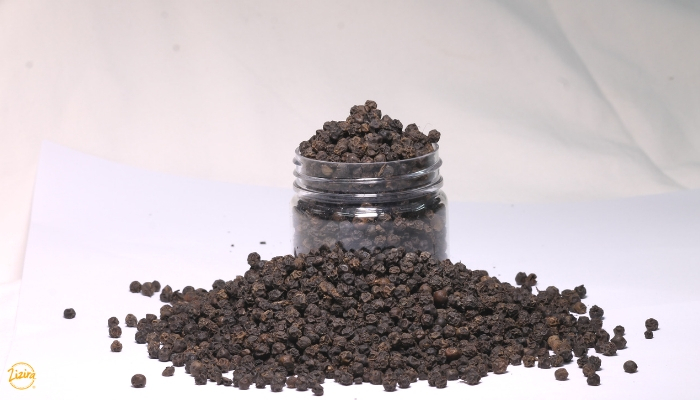 Black pepper is another hot seller. And so are black sesame and perilla seeds. Bei sources these spices too from Jaintia hills through her suppliers in Jowai. Another item that sells well is a curious one. Limestone chunks. Bei says it like an addiction for some people. They love nibbling the chunks as we’d nibble on apples! But she has no idea why these people love limestone. At Rs. 5 apiece she sells about 30 pieces a day, sometimes more! And does Bei love her occupation? She does. This shop fed her and her family and made them the people they are today. All her children are doing well. One child is an engineer; others are teachers and officers in government. One grandchild, Dr. Amanda Shylla, a scientist in microbiology, was recently awarded two gold medals. And with so many friends visiting her shop daily, Bei never has a dull moment any day. Well, our date with Bei finally had to end. But it was quite a revealing tête-a-tête with the grand old lady. As I thanked her for her generosity with her time (and yes, she gave us tea too) she gave a light slap on my hand. ‘Come again another time but do buy something as well’ she said. That twinkle in her eyes and mischievous, toothless grin on her face were unmistakable. Bei Bina is an ordinary woman with a story out of it. At Zizira we continue to move among the ordinary to discover the extraordinary. That’s how we are able to bring out for your products out of the ordinary, every time. Come to discover us today at Zizira.